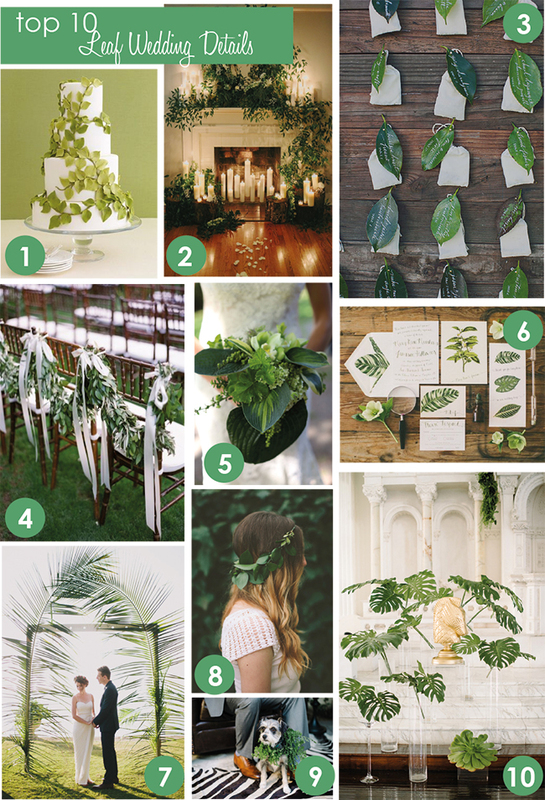 A few weeks ago I posted the Top 10 Herb wedding details, well, my love for wedding greenery continues, this time it's in the form of leaves. All kinds of beautiful leaves from delicate to enormous. This trend is so good, you won't even miss this blooms! 1. a leaf decorated wedding cake, like this one found on Inspired by This Blog. 2. A drop-dead gorgeous, candle-light, foliage-infused ceremony backdrop by Cedarwood weddings. 4. Lush garland draping the ceremony chairs from Martha Stewart Weddings. 5. Florist, Joe Pye Weed's Garden, gives us proof that a bouquet doesn't need blooms to be beautiful. Photo via Style Me Pretty. 6. Southland Fox designed this perfect vintage botanical suite via Green Wedding Shoes. 7. Light and lush giant palm leaves make an amazing one-of-a-kind backdrop for this Sayulita Wedding. 8. A flower crown with out the flowers is just as beautiful as with, get the DIY instructions from 100 Layer Cake. 9. Dogs can get in on the action too, love this leafy wreath from this green and white styled shoot. 10. This minimal palm backdrop, by Shawn Yamamoto is perfection, found on 100 Layer Cake.